Los Angeles, CA — Davion Shawntell Oatez (08-22-94) was taken into custody yesterday and charged with two felony counts of Penal Code § 597(a) animal cruelty and a weapons enhancement for the use of a dangerous weapon in the commission of a felony Penal Code § 12022 (b) (1). The arrest is the result of an investigation by the Animal Cruelty Investigations division of the Society for the Prevention of Cruelty to Animals Los Angeles (spcaLA). On October 11, 2016, a neighbor witnessed Oatez beating his 3 month old male Pit Bull, Fifty, with the handle of a mop and throwing him forcefully to the ground by his neck. A second incident began about 30 minutes later with Oatez beating and punching the dog while Fifty screamed and cried. The eye witness recorded these incidents with a cell phone and reported the acts of animal cruelty to spcaLA. The neighbor provided spcaLA Humane Officers with copies of the video as well as posting to a public Facebook page. spcaLA Humane Officers went to Oatez’ residence at 1549 West 35th Street in Los Angeles on October 12, 2016. After questioning and with clear video evidence, Fifty was seized from Oatez. Upon examination by spcaLA’s Veterinarian Team, it was determined that Fifty “undoubtedly suffered from the violent mistreatment and beating inflicted by his owner.” spcaLA Humane Officers obtained an arrest warrant and Oatez was brought into custody by spcaLA Humane Officers with assistance from the Los Angeles Police Department Fugitive Task Force Detectives. Fifty has since been adopted. Oatez has posted bail and is scheduled to appear in the Los Angeles Superior Court Department 56 on December 30, 2016.
spcaLA is the only private animal welfare organization in Los Angeles that is also Law Enforcement. spcaLA Humane Officers hold the same powers of Peace Officers in the state of California when investigating animal cruelty. spcaLA is a non-profit agency that relies on donations for its programs and services, including animal cruelty investigations. 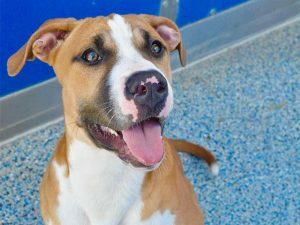 To donate, please visit spcaLA.com or call 323-730-5300 x233.